Anyone who knows me fairly well will tell you that I have a weakness for carriage horses! No matter what city I'm in, I will find them if they are there! 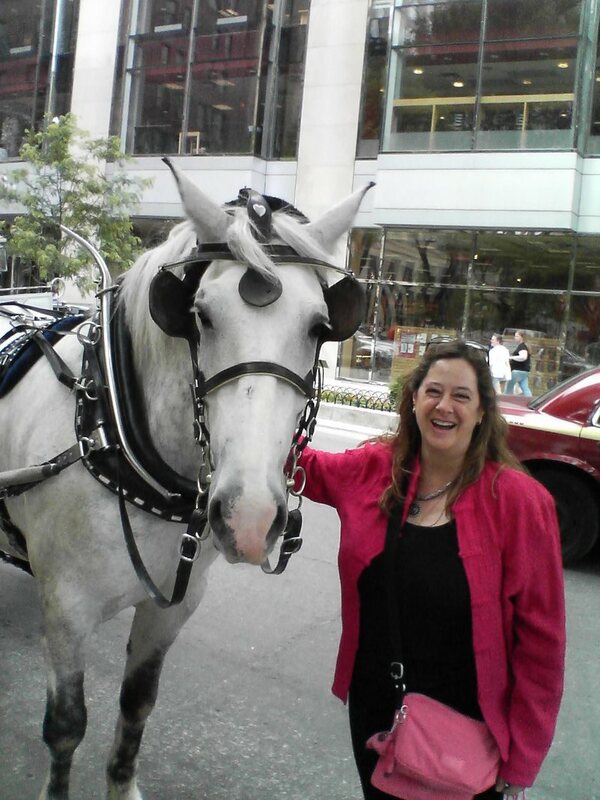 This is Tate, the very steady steed who took Jim and me on a hour long carriage ride through down town Chicago. We trotted past lake Michigan, up and down beautiful side streets with row after row of interesting townhomes and through the varied little villages that make downtown Chicago the incredibly diverse city that it is. Isn't he GORGEOUS! A one hour carriage ride snuggling with your sweetheart is far less costly than a bad dinner, and much more refreshing! (At least in my opinion!) You'll find Tate waiting for you at the Old Water Tower along Michigan Ave, right across from Borders Books and the Ghiradelli Chocolate store! I may finally have found a summer drink that I love! 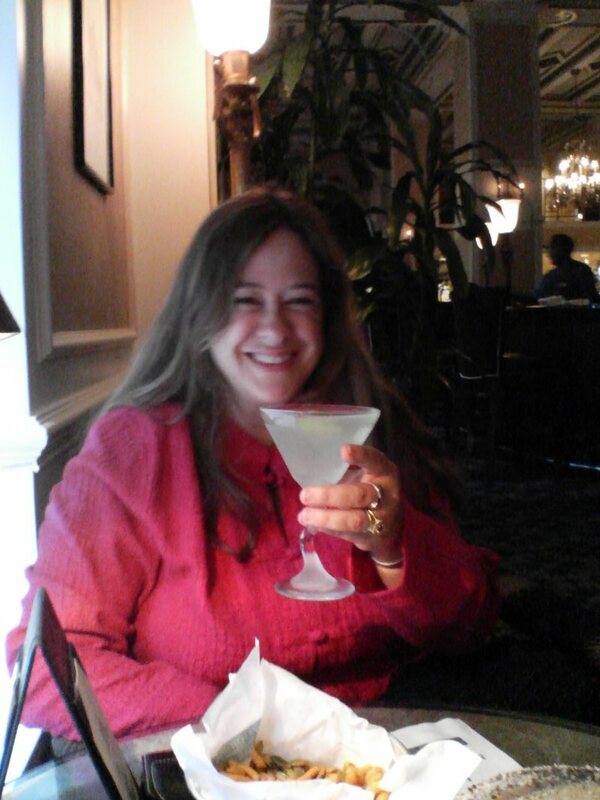 Here I am enjoying a Gimlet martini at the Knickerbocker bar in Chicago! A Gimlet martini is a wonderful composition of citron flavored vodka or gin, Rose's lime juice and freshly squeezed lime juice shaken together with alot of ice! It's a wonderfully refreshing martini, whether you have it straight up or on the rocks! I think that I am also going to try to make this with fresh cucumber juice and some Hendricks Gin! For those of you not familiar with Hendricks, it's a wonderful gin, my absolute favorite made in Scotland and flavoured with cucumbers and rose petals and other fabulously herby flavours.....need I say more?! The Prince of Wales Hotel/Niagara on The Lake! Last month, my husband and I took a lovely trip up to Niagara on the Lake with our good friends, Bethane and Carl. We stayed at the Prince of Wales Hotel, an experience that I would suggest to anyone looking for a touch of European ambience. http://www.vintage-hotels.com/Properties/?pid=pow The hotel was perfect, the accomodations sublime with a bathroom equipped with a heated towel rack, and a lovely jacuzzi tub. We stayed in "The Blue Room" which was the most gorgeous shade of Indigo, with blue toille fabric on the drapes and beds. The canopy made me feel like a princess, and every evening thay give you a personalized weather forecast, a rose on your pillow and some lovely chocolate. There was a bowl of fresh fruit in our room upon arrival, and our sweet waitress in the tea room packed us each a little midnight snack box, which we enjoyed in the evening when we returned to our very sumptuous rooms! The swimming pool in the spa area was filled with salt water, creating a feeling of relaxation everytime you got into it. The restaurants were extraordinary and the afternoon tea was just as I remembered English high tea to be. The carriage rides through the lovely town were incredibly romantic,and even though it was as cold as could be, we were warmly wrapped in toasty blankets! Niagara on the Lake is as close to Great Britain as you are going to get on this side of the Atlantic. The town is filled with tea rooms, and little Scottish bakeries. Greaves Jams and Jellies are a must have and I am especially addicted to their apple cinnamon jelly and their apricot and almond jam! http://www.greavesjams.com/ The Niagara region is filled with beautiful vineyards that specialize in Ice Wine (a fragrant very sweet dessert wine) and they are all open for tours and generous tastings! In fact, we ate at a lovely vineyard that was highly recommended by our friends. The Peller Estates serves a tremendous five course meal with their own wines that they have chosen for each course and a palate cleanser of a red wine sorbet in between the salad and main course. The food is seasonal, regional , perfectly prepared and FLAWLESSLY served! http://www.peller.com/peller/index.asp Thankfully, the Prince of Wales Hotel provided a car and driver to take us to dinner and back, so we were able to enjoy ourselves completely without concern!